“You need friends to play with. Hop online and make some, or play locally with some pizza.” Right, let’s get it out the way. 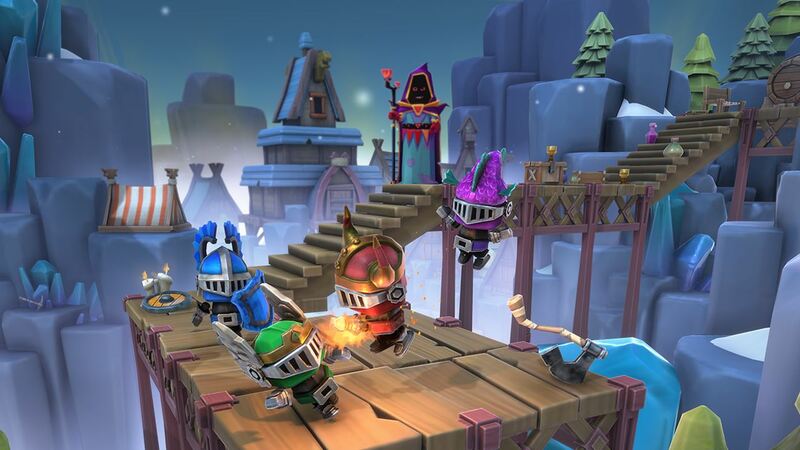 Big Crown Showdown is a multiplayer game first and foremost. You can’t play solo against AI-controlled rivals, meaning that, for those without friends to compete against, it’s not a game that you will want to add to your Nintendo eShop wish list. But, I guess that’s not the point. After an opening animated cartoon strip shows the great wizard Fonkin effortlessly dethroning the old King Krabbit by blasting him out of the nearest window, The Grumblegard – who were too busy playing a video game together to protect him – are banished for 100 years. When they return – still glued to the same game – an advert interrupts their progress, promoting the annual Big Crown Showdown in which contestants must brave increasingly perilous assault courses to claim the elusive crown. And, to the surprise of The Grumblegard, they have been selected to participate. That’s where you come in. Big Crown Showdown’s medieval world has all the ingredients that you could want from what quickly becomes a hilariously chaotic experience. To compete for the crown, you must overcome treacherous courses whose creators have tried their best to laden with traps in an, often successful, attempt to catch you out. These precarious gauntlets – situated in Kasseltoon, Zoggysands and Shivershire – are based on a steampunk-inspired medieval castle, a sandy cityscape in Ancient Egypt, and the chilly landscapes where the Vikings had once dwelled. You will need to dodge swinging axes, leap across cogs and slide along aqueducts to succeed. But, with only 15 courses, repetition soon looms over longer sessions, although is less problematic in quick bursts – something that Big Crown Showdown’s manic nature is perfect for. Played from an isometric perspective, the auto-scrolling camera makes keeping ahead of your rivals far trickier and, importantly, far more pressurising. Even your race to the finish is only half the battle, as your competition swing charged punches in your direction that threaten to send you flying off course – accompanied with a mischievous giggle from their origin. The controls are simplistic in that they are limited to movement, jumping, punching and blocking – something that I never really felt that I needed or had time to do – meaning that Big Crown Showdown is a good match for split Joy-Con play. So far so good, but Big Crown Showdown carries some clear flaws. There’s only one mode – split between Local and Online options – that, while entertaining, really needed a few more ideas to accompany it. Sure, creating a Custom Game lends some flexibility over whether, say, players will be eliminated straight away after they lose a single life or lets you make punches pack more power, but the content lacks breadth. Chests that you can smack open on courses will reward you with coins that you can use to buy new helmets, but, well, that’s it. Worse still, the online community is dead. Big Crown Showdown is a laughter-inducing experience that, to no one’s surprise, is at its best when four players are trying to claim the crown. Worryingly, I have spent many hours selecting the Quick Play option to then wait to see whether another player would turn up in my lobby, with no luck. Even when a friend created a Custom Game for me to join, the matchmaking system didn’t manage to find it. Whether there’s an underlying problem is unclear, but, eventually, we gave up and simply used Quick Play to randomly join the same lobby. Which is not ideal. It is in local multiplayer, then, that Big Crown Showdown excels, although in its current state that’s by default. Fun, frantic and maddening in places, there’s undeniable potential in the idea that it has been built around, it’s just the execution and, sadly, lack of online interest that sees it fumble short of the finish line.